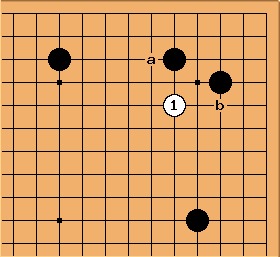 Depending on what side the opponent chooses to protect, White plays a tsuke at a or b on the other side and aims at making sabaki, which is a light running form that either builds eyes or connects to your own groups. With sabaki one does not have to be greedy though and sacrifice the tails rather than make a group heavy. um.. anyway, i hope to add two (and very easy and useful) variations after this . to speak roughly, there r two moves that black can choose against . First is . 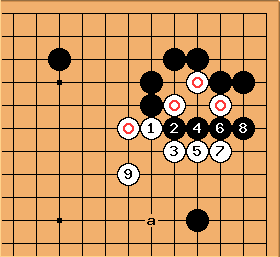 This move is mainly for protecting black's upper-side. 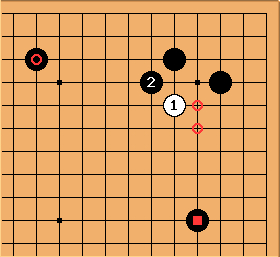 If you think that upper side is more valuable than right-side, you should play this move as black. The moves from to can be considered as one of middle fight joseki. BUT!!! white can choose to play at a instead of depending on ...um...conditions or ...circumstances. Um...btw, black's b or c might be trouble for many beginners as white. But, these two moves can NEVER work well. The following 2 diagrams r simple demonstrations to show this. bud1027 As for black-b cutting, white would give up his three stones happily. These stones r not white's body, but just its tail, thus all that black can take by cutting is just small cash. 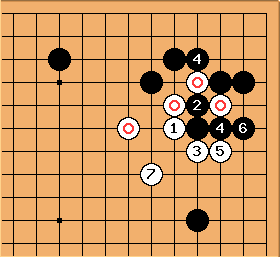 On the contrary, at present, white's stones r naturally flowing (or streaming?) into center and making wall in right-side. As result, black stone in right-side looks very lonely. 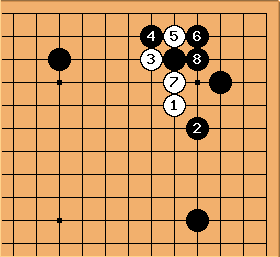 Of course, this flow of stones is obviously bad for black. No strange that black would resign right now. I think this variation is easy and obvious to understand. Thus no explanation. is the second move to choose as black. If black considers right-side as more valuable, he should play this. Now, white should reduce black's upper-side and is the most common way to do it. This is the end of second variation. In this diagram, I should emphasize the move, . is the POINT that you should know about this variation. 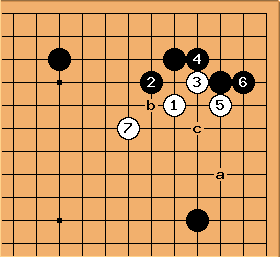 this move is light, and flexible move to reduce b's moyo and to ....um stablize white's group simultaneously. Instead of , if white play a (really heavy move), this white group become very cute and lovable target of black's attack at sudden, thus the hell will be waiting for u.
Charles By the way, this is a 'strange' position, so discussing middlegame joseki here is (even more than usually) questionable. If you want to talk about here, it ought to be in context with . Black's extension one line less, as shown above, is not really a pro play anyway. But I think given Black ought to think in terms of one of the circled points, anyway. Um...I think you might be right, although I'm not sure. Anyway, if you are right, your mentioning about the White b move in the first diagram is also strange and questionable ... and unnecessary, because, according to what you are saying, in this context, Black would not defend the upper side. ChrisSchack: I think you have to take everything into account. Knowing that Black should defend the side, not the top, all things being equal, doesn't help if Black does otherwise or all things aren't equal ... and you don't know how to follow up on it. bud1027: Chris, what do you mean? I can't understand. Charles Please don't use Internet abbreviations. SL style is to use correct English. Everyone should write as well as they can - English language corrections will be made if you can just be clear. ChrisSchack: I just mean that one may be a bit better than the other, but if you don't think about both, you may get caught out, saying "But ... but you're not supposed to DO that!" By the way, Chris, where is your saying <<"But ... but you're not supposed to DO that! ">> in your initial writing?